The Adelphi Theatre Project: Graphics, Image for Flowers of the Forest! Graphics, Image for Flowers of the Forest! Flowers of the Forest! by John Buckstone. The new drama about to be produced at the ADELPHI, by Mr. Buckstone, will be called "The Flowers of the Forest." Its cast comprises Messrs. Wright, O. Smith, Paul Bedford, Madame Celeste, Mrs. Fitzwilliam, and Miss Woolgar. The representation has, we believe, been delayed by the severe indisposition of the last named actress. She is, however, recovering. The announcement of a new drama by Mr. Buckstone was sure to create some little interest in the theatrical world; and, accordingly, the doors of the Adelphi were stormed on Thursday evening by a large crowd of playgoers anxious to witness the last production of the author of "The Wreck Ashore," and "The Green Bushes"--two pieces which may be placed at the head of their cast in the English school of melodrama. They were not disappointed as the "Flowers of the Forest" was triumphantly successful, albeit its performance occupied within a few minutes of four hours--a time unprecedented for the representation of a three act drama. As in Mr. Buckstone's other dramas, the period of action is laid about a century ago and the interest is centred in a clever union of the deeds of the romantic and domestic classes of the dramatis personæ. The plot is too complicated to give in detail, but it turns on the devotion of an Italian gipsy, Zingana (Mdme. Celeste), living with an English tribe, to a young Englishman, Alfred (Mr. Boyce), whom she had met abroad. 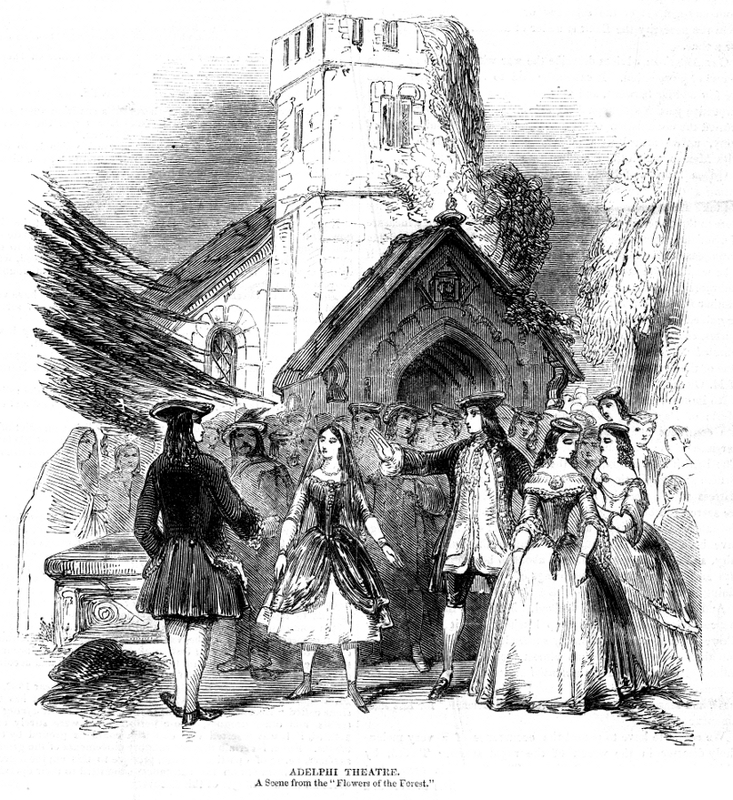 Wandering to our land with her father, Ishmael (Mr. O. Smith), she finds Alfred about to be married to the Lady Agnes (Miss E. Harding), sister to Captain Lavrock (Mr. C. J. Smith.) She watches the wedding and interrupts it at the church-door. The liaison thus becomes known, and the result is that Alfred is challenged by Lavrock. Lavrock has in the morning soundly horsewhipped a young gipsy boy, Lemuel (Miss Woolgar), who swears to be revenged. The duelists meet at Skiddaw. Alfred refuses to fight, but, goaded on by Lavrock, he takes his place and fires in the air when, at the same instant, Lemuel, who is on the watch, fires and shoots Lavock to the heart. He then escapes, and Alfred is, of course, accused of the murder, although bewildered as to the cause of the other's death. Cynthia, the Zingana, contrives to rescue him from the room in which he is confined with the assistance of another gipsy, Starlight Bess (Mrs. Fitzwilliam). By her father's orders, however, he is given up, but the Italian, having overheard Lemuel confess his guilt to Bess, drags him to the Court of Justice. For this, she is cast out of the tribe, and left to perish, when Bess, who is engaged to Lemuel, and whose heart is breaking at his fate, takes compassion on her, in spite of everything, and leads her back. Ishmael agrees to receive her on one condition--that she will kill Alfred, whom they have got in their power. She promises to do so, but, instead, stabs herself, and with her death, the piece concludes. In an underplot, the fun is well kept up by Cheap Jack (Mr. Wright) and The Kinchin (Mr. Paul Bedford), who appear first as vendors of cheap Sheffield goods and, secondly, as sham criminal lawyers; lastly figuring in the stocks. The piece was admirably played. To Miss Woolgar must the greatest praise be awarded, her acting far exceeding all that she has ever done. Her part was not one of comedy, but of deep melodrama, and, in the opening scene of the third act, she played with such intensity and truthfulness that the action was constantly delayed by the loud bursts of applause from the house: indeed, throughout the piece, her performance was most admirable. Madame Celeste had full scope for her clever and striking peculiarities, and Mrs. Fitzwilliam's Starlight Bess was a charming and effective impersonation. Mr. O. Smith looked, as he always does, a perfect picture, and Messrs. Wright and Bedford were themselves, which means that they kept the house in roars of laughter whenever they were on the stage. We cannot conclude this notice without speaking in the highest terms of the scenery by Messrs. Pitt and Johnstone, which is the most beautiful we ever saw at the Adelphi. Every scene, as it was discovered, drew forth the applause of the audience, and most deservedly so. At the conclusion, all the chief performers re-appeared, amidst enthusiastic cheering. Madame Celeste announced the drama for repetition, and then Mr. Buckstone bowed his acknowledgments before the curtain. We would recommend considerable curtailment in the first and second acts, and then "The Flowers of the Forest" will flourish at the Adelphi for many nights to come. At the ADELPHI, "The Flowers of the Forest" is drawing money, so much so, that we hear Mr. Webster will not care particularly to bring forward any other novelty for Easter, reserving his burlesque until the attraction of the drama begins to flag. Some curtailments have been made since the first representation, but we scarcely think with a sufficiently unsparing hand. On the second representation, Madame Celeste was suffering from severe indisposition; most probably induced by her exertions on the first night, and we hear that Miss Woolgar fainted after leaving the stage in one of the scenes and was only enabled to go through the performance by the use of stimulants. The Adelphi has been singularly unfortunate with respect to the health of the principal members of its corps. THE ADELPHI relies upon, the attraction of its present bill, and therefore no novelty will be produced on Monday evening. "The Flowers of the Forest," by Mr. Buckstone, and Mr. Charles Selby's Terpsichorean burlesque of "The Phantom Dancers," will form the entertainments; the different pieces in preparation being kept back until the attraction of the drama begins to be on the wane, which, however, we do not expect will be just yet. Miss Woolgar, the popular actress, since her appearance to "The Flowers of the Forest," at the ADELPHI theatre, has received several most flattering congratulations on her success therein; among others, we may mention Sir Edward Bulwer Lytton as having expressed his high sense of her abilities, and the wish that she should assume a higher position in her profession, to which he thinks she is entitled. He stated that he should like to see her play Pauline in his own piece of "The Lady of Lyons." ADELPHI THEATRE. No new piece was produced here on Monday, yet no theatre in the metropolis presented greater attractions. Mr. Buckstone's last drama of "The Flowers of the Forest" was performed for the fourteenth time and was received with increased enthusiasm. It is in characters like that of the Zingara that Madame Celeste is completely at home; her "make up" is most picturesque and artistic, and the like praise may be awarded to Mr. O. Smith. The beautiful acting of Miss Woolgar and Mrs. Fitzwilliam in the first scene of the third act was, as usual, loudly applauded. Lem. Dear Bess, my Bright Bess, I do think if I were to tell you I should be happier and bolder. I will--I can't live any longer with this weight at my heart. You'll forgive me, and excuse me, if no one else will! (CYNTHIA again appears amongst the foliage) Bess, listen, bend down your ear--I killed that man! Don't shrink from me yet, don't. [CYNTHIA'S eyes are now fixed with wild intensity upon LEMUEL. Cyn. 'Twas you! You were the assassin! My father, too, the witness! Come Away--you shall, and prevent the shedding of innocent blood. Struggle not--try not to escape--you are as safe in my grasp as a bird in the talons of a hawk! Bess. Where would you take him? Let him be! Take off your hold! What, if he did do what he says, we care for none beyond our own people; take him not away! He's of our own blood! Lemuel, dash her to the ground! Cyn. You cannot move! Your guilt makes you as weak as a child. Come with me, life and death are in my speed, think not to break from me, you know not the misery of madness and despair! Bess. I will! Break from her and run! Call up the tribe! Cyn. No, no: you may writhe, you may plunge, but I have you safe! Come Away! Come! Come! Come! [Music.--She drags him off, L., LEMUEL struggles violently, while BESS clings to him. Bess (as they go off). You shan't hurt him! Lemuel put out all your strength. Don't be afraid! The Drama has been published, and we are happy to find by the author's statement that it is original; its story being adapted neither from tale, novel, nor any foreign source; while the manners and habits of the Gipsies, which he has gathered from reading and the accounts from persons who have been much amongst them, he believes to be faithfully rendered. The casting forth a delinquent gipsy from his tribe is considered the heaviest punishment and disgrace that can be inflicted; while the ceremonial is usually most impressive and conducted with great earnestness and form and frequently in the presence of many hundreds of the strange race. This curse is given with great effect towards the close of the piece. Altogether, this is, perhaps, the best drama Mr. Buckstone has ever produced, and we predict that it will have a long career of success. We do not greatly admire the characters of Messrs. Wright and Paul Bedford; they are too much in the caricature style for the other dramatis personæ, though comic reliefs may be requisite. The revived semi-burlesque of the "Phantom Dancers" followed the melodrama, and went off as well as ever; indeed, we rarely remember to have seen a piece so completely revived; usually, the oftener a performance is repeated, the less it is perfect. The published drama of the "Flowers of the Forest," is dedicated by Mr. Buckstone to his "friend and old companion," Mr. T. Sidney Cooper, R. A., who was the youthful artist of "a certain Theatre Rural on the Sussex coast," where Mr. Buckstone was "the equally youthful actor of all-work." In the scene of the "Gipsy Encampment," in the drama, the old white horse and black donkey are the work of Mr. Cooper's hand and brush; and very life-like they are. The Dedication throughout is a warm piece of bonhomie. ADELPHI. "The Flowers of the Forest," "Jenny Lind," and "The Double-Bedded Room"--all pieces known to the public and all capable of still keeping the public in a roar--drew a good audience (for the weather) to this house on Monday, who cried with Mrs. Fitzwilliam and Miss Woolgar and roared with Mr. Paul Bedford and Mr. Wright and went through so many alternations of pathetic and comical feeling that the laughter at the last piece completed their perfect exhaustion. On Wednesday, on the occasion of Madame Celeste's benefit, a new petite comedy was performed, called "Flying Colours"--evidently an adaptation from the French--the scene being laid in Lorraine, about the time of Louis XV. We can never clearly understand the plots of these French intrigue pieces, and the slight story upon which the incidents of the vaudeville in question were hung was not sufficiently interesting to call for very close attention to its progress. In fact, it was too long, and, although Mr. Webster, Madame Celeste, Miss Woolgar and Mr. Selby all made the most of their parts, we question if the audience did not feel a certain relief when it was over. It was, however, perfectly successful; indeed, there was not a dissentient voice to speak of in the very crowded house, and this speaks well in its favour, for, if anything would make a person discontented, it would be being in the centre of a crowded Adelphi audience during the present weather. MRS. FITZWILLIAM.--M. Baugniet has just drawn on stone a whole-length portrait of Mrs. Fitzwilliam, as Starlight Bess, in the clever Adelphi drama of the "Flowers of the Forest." The likeness is admirable; and the esprit of the character-- a matchless impersonation--is charmingly transferred.